In general I've always been able to get by with my knife and flashlight, but there are still those situations where it'd be great to have a pair of pliers or a screwdriver to save your knife. Those times are best handled with a multi-tool. 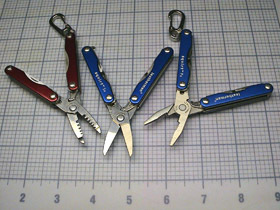 There is always the classic SAK (Swiss Army Knife) or the newer type Leatherman style multi-tool. Either one of these can be a real life-saver (literally) in the right situation. I currently carry a Leatherman P4 on my regular keychain and a Leatherman S4 on my work keys. Swiss Army Knives Swiss Army Knives have been around for a long time and whether you are a fan of Victorinox or Wenger, they are extremely useful to have. These are classic designs that have withstood the test of time. Leatherman Anyone who has every used the pliers on a SAK knows that the SAK is a knife first, pliers later type of tool. Leatherman changed that by adding tools to a pair of pliers that makes for a much more comfortable tool. The Leatherman can be a bit more bulky than the SAK, but it definitely has developed its own niche. Other Following the Leatherman, a lot of other companies have come out with their own mult-tools. Among those are brands like SOG and Gerber, but these companies don't have the same selection as Leatherman or the SAKs so I've just grouped them into their own little section.